I warned you guys that I have this top in 4 colors now! haha I ordered it in a pink stripe pattern, recently too! Actually, each color is a different brand, but they're all very similar. The blue one that I have and wore first here on the blog (my favorite, still!) is a similar design, but the ruffles are much larger, and they're more stiff, so you can kind of make it do what you want. I really like that about that top. You can stand the ruffles up, or let them fall a little more naturally, but either way, it's definitely a statement piece! The ruffles on this top are a lot lighter, and a bit smaller, though still fun. Plus, it adds a bit of green to my wardrobe, which I do not have much of! I was inspired by the colors of my Mother's Day tulips that my sweet family got for me (really my sweet husband, let's be honest... toddlers don't do a lot of shopping by themselves, nor do they have jobs! haha)! After looking at these pretty tulips all week on the counter, green and bright pink just seemed like a really pretty, natural combination of colors for Spring! So, I added my fun new statement earrings from Target, my pink pumps, and a pretty pink lipstick, and I think the pink accessories really brightened up the look! 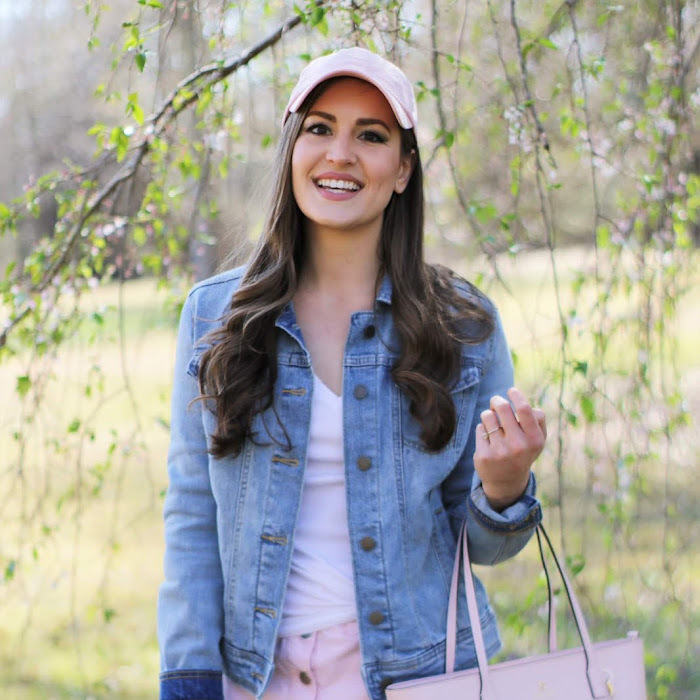 Below, I'm sharing some fun bright pink accessories I'm loving for Spring. I hope you love them, too! I also hope you're having a wonderful and productive Monday, and thank you so much for reading! It's absolutely amazing, Jessica, and I can see why you got it in green! And then with the pink shoes?? So darling!! Isn't that a fun color combo? Thank you so much, Jodie! It wasn't bad at all! I loved how they turned out, too! I love the green ruffle top, it looks really cool. I hope you have a wonderful day. Isn't it fun? Thank you so much, Courtney!! You have a great day, too! I honestly cannot believe the shirts you continue to pull off! I dream of being able to wear stuff like this, it's so beautiful! That top is fantastic! I love it!! Thank you so much, Joy! Super affordable too! Loving the ruffles, Jessica! Such a pretty top! Thank you so much, Vanessa! Hope your Monday has been great! I love the pops of pink in the earrings and shoes! So colorful for summer! Thank you, Marianna! Hope your Monday's been great! How do you keep finding these amazing tops! The pink shoes and earrings are so chic with it. I think it's a gift, but my husband might disagree! hahaha Thank you so much! Ob. Sessed! 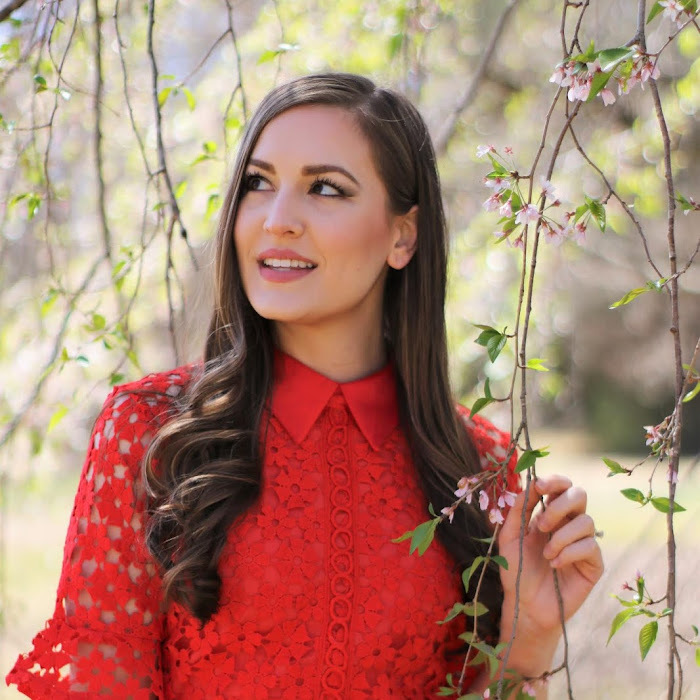 This is such a cute top (and look) and I adore it with the pops of pink! Awww, thank you so much, Laura! Hope you're having a great Tuesday! What a fab ruffled top, and you the pink heels that matches the earrings really wrapped up the whole look! Thank you so so much, Jessica! Have a great day! So wonderful your ruffled blouse! Isn't it fun? Thank you, Rena! I love the ruffled blouse! It suits you perfectly, such a nice springloc. Thank you so much, Amely Rose! Have a wonderful Tuesday! No one does frill blouses so beautifully like you. Another lovely top there Jessica. Thank you, Missy May! Have a wonderful day! The more ruffles the better! 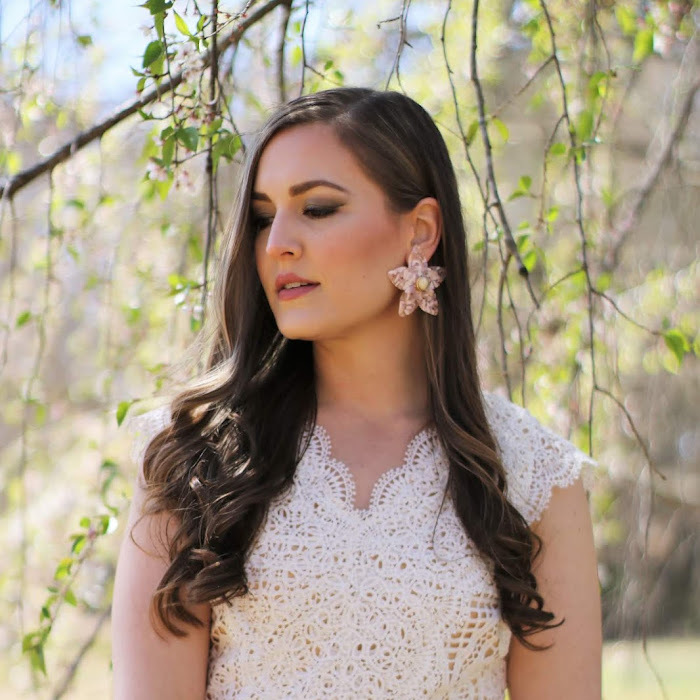 What a gorgeous top, and I love those pink earrings!! Thank you so much, Krisztina!! Have a great evening! That top and heel combo is everything!! You look gorgeous!! Thank you so so much, Lesley! Have a great night! Your top is really fun with all that ruffles is just your style. I like too the pink heels. Thank you so much, Marisa! Hope you have a great Wednesday! Thank you so much, April! Have a wonderful Thursday! Thank you so much, Alexandra! Have a great day!